The scientific discoveries that have been made with noble gas geochemistry are of such a profound and fundamental nature that earth science textbooks should be full of examples. Surprisingly, this really is not so. The "first discoveries" include presolar components in our _ solar system, extinct radionuclides, primordial volatiles in the Earth, the degassing history of Mars, secular changes in the solar wind, reliable present day mantle degassing fluxes, the fluxes of extraterrestrial material to Earth, groundwater paleotemperatures and the ages of the oldest landscapes on Earth. Noble gas geochemistry has scored so many such "firsts" or "home runs" that it should permeate a lot of earth science thinking and teaching. Yet rather surprisingly it does not. 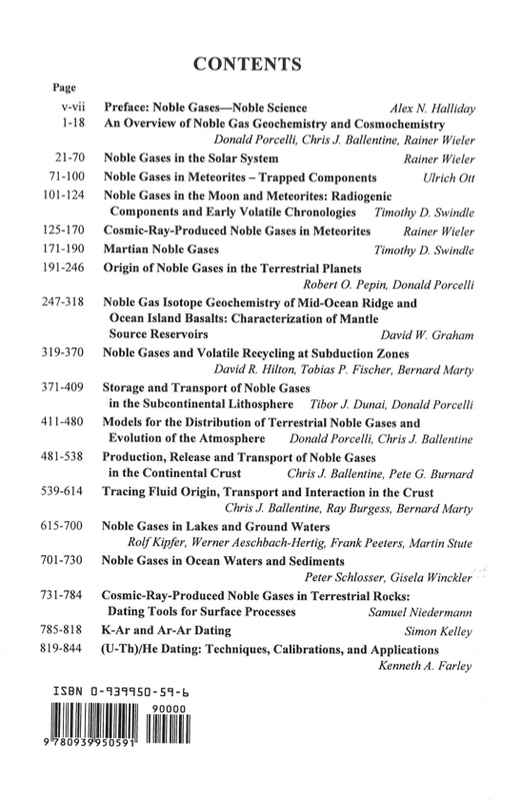 Noble gas geochemistry also is a broader and more versatile field than almost any other area of geochemistry. It pervades cosmochemistry, Earth sciences, ocean sciences, climate studies and environmental sciences. Yet most modern Earth, planetary and environmental science departments do not consider noble gas geochemistry to be at the top of their list in terms of hiring priorities these days. Furthermore, with the exception of Ar geochronologists, noble gas geochemists are a surprisingly rare breed. Why is the above the case? Perhaps the reasons lie in the nature of the field itself. First, although noble gas geochemists work on big problems, the context of their data is often woefully under-constrained so that it becomes hard to make progress beyond the first order fundamental discoveries. Noble gas data are often difficult to interpret. Although some concepts are straightforward and striking in their immediate implications (e.g. mantle 3He in the oceans), others are to this day shrouded in lack of clarity. The simple reason for this is that in many situations it is only the noble gases that offer any real insights at all and the context of other constraints simply does not exist. Some examples of the big issues being addressed by noble gases are as follows and I have deliberately posed these as major unresolved questions that only exist because noble gas geochemistry has opened windows through which to view large-scale issues and processes that otherwise would be obscure. (1) Is the presolar noble gas component present in a tiny fraction of submicroscopic meteoritic C or is it ubiquitously distributed? (2) How did solar noble gases get incorporated into the Earth? (3) How did solar noble gases survive the protracted accretion of the Earth via giant impacts? (4) What is the origin of the noble gas pattern in the Earth's atmosphere? (5) Why are the Earth and Mars almost opposites in terms of the relative isotopic differences between atmosphere and mantle? (6) What is the Eresent source of Earth's primordial helium? Can we ignore the core? (7) What is the 2~e/ 2Ne of the mantle, how was it acquired and why is it different from the atmosphere? (8) How does one reconcile the stronlJ fractionation in terrestrial Xe with data for other noble gases? (9) How much radiogenic Ar should the Earth have? How well do we know KIU? (10) Are the light isotopes of Xe the same in the mantle and the atmosphere? If not, why not? (11) How are noble gases transported through the creeping solid earth? (12) How does one explain the heat - helium paradox? (13) How incompatible are the noble gases during melting? (14) How are atmospheric components incorporated into volcanic samples? (15) How are the excess air components incorporated into groundwater? (16) Why are continental noble gas paleotemperature records offset from oceanic temperature records? Noble gas data tell us that the Earth and solar system represent very complex environments. When we make our simple first order conclusions and models we are only at the tip of the iceberg of discoveries that are needed to arrive at a thorough understanding of the behavior of volatiles in the solar system. Who wants to hear that things are complicated? Who wants to hire in a field that will involve decades of data acquisition and analysis in order to sort out the solar system? Sadly, too few these days. This is the stuff of deep scientific giants and bold, technically difficult long-term research programs. It is not for those who prefer superficiality and quick, glamorous, slick answers. Noble gas geochemists work in many areas where progress is slow and difficult even though the issues are huge. This probably plays a part in the limited marketability of noble gas geochemistry to the nonspecialist. Second, noble gases is a technically difficult subject. That is, noble gas geochemists need to be adept 11t technique development and this has to include skills acquired through innovation in the lab. Nobody can learn this stuff merely with a book or practical guide. Reading Zen and the Art of Motorcycle Maintenance (by Robert Pirsig) would give you a clearer picture. This magnificent MSA-GS volume is going to be enormously useful but on its own it won't make anybody into a noble gas geochemist. Although the mass spectrometry principles are not complex, the tricks involved in getting better data are often self taught or passed on by working with individuals who themselves are pushing the boundaries further. Furthermore, much of the exciting new science is linked with technical developments that allow us to move beyond the current measurement capabilities. Be they better crushing devices, laser resonance time of flight, multiple collection or compressor sources - the technical issues are central to progress. Lastly, noble gas geochemists need a broad range of other skills in order to make progress. They have to be good at mass spectrometry as already stated. However, nowadays they also need to be able to understand fields as different as mantle geochemistry, stellar evolution, cosmochemistry, crustal fluids, oceanography and glaciology. They are kind of "Renaissance" individuals. Therefore, if you are thinking broadly about hiring scientists who love science and stand a good chance of making a major difference to our understanding of the solar system, earth and its environment - I would recommend you hire a really good noble gas geochemist. However, the results may take a while. If you want somebody who will crank out papers at high speed and quickly increase the publication numbers of your department then you may need to think about somebody else. The two are not mutually exclusive but think hard about what is really important. 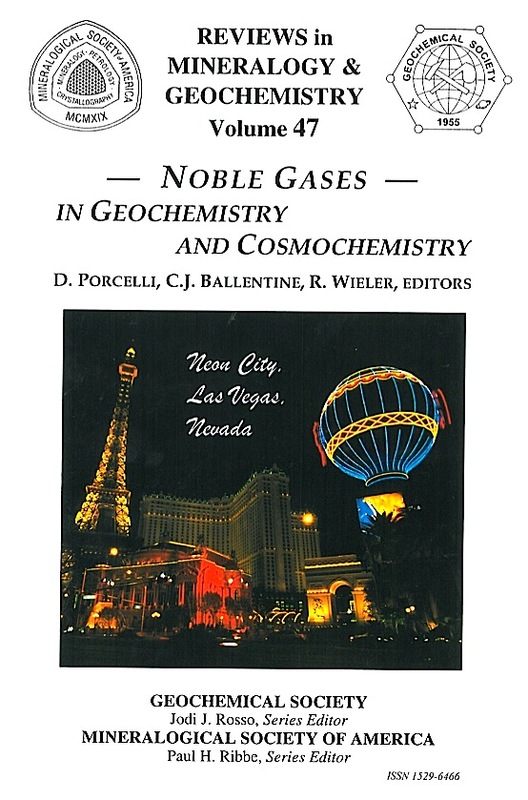 There was no short course associated with this volume, although an attempt was undertaken to get the volume printed in time for the V. M. Goldschmidt conference in Davos, Switzerland (mid-August 2002) at which there was a major symposium on noble gases.